In the fast-paced, multi-billion dollar licensing industry, you don't have time to reinvent the wheel every time you need to draft or negotiate a strong, enforceable licensing agreement. 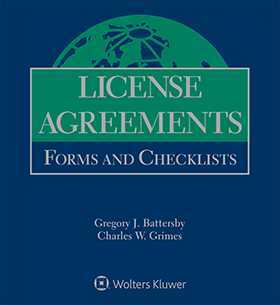 License Agreements: Forms and Checklists, Second Edition puts at your fingertips -- and on your computer screen -- all the critical tools needed to draft, negotiate, and finalize licensing deals more quickly and effectively. Compiled by nationally renowned licensing law authorities Gregory J. Battersby and Charles W. Grimes, this time-saving reference gives you proven-effective agreements that can be used as the starting point for the preparation and negotiation of virtually any licensing transaction.